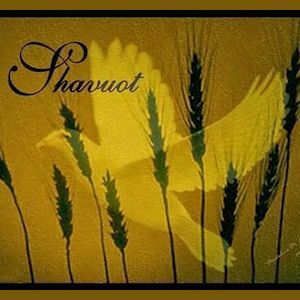 Shavuot is the Feast of Weeks. For Christians it is Pentecost… in the Jewish year, for me, it is my legal wedding anniversary to Rich Hemstreet. Our legal wedding was actually May 23, 2007 (our “real” spiritual wedding was August 10, 2007). I didn’t plan it that way, but I remember looking at the calendar as we got ready to leave for the courthouse and realized it was Shavuot. Somehow that made our wedding that more special. Truthfully, the past few weeks have been a bit rough. I underwent a medical procedure to treat a muscle that is not working properly, put my back out a few days after, missed a week of work, and oddly, all of my devotionals have focused in some way on different things that remind me of Rich. Between all that, and trying to finish my book… yes, I’m still working on it… you can imagine how I’ve been feeling. For those who are wondering, I am working on my autobiography. Actually, the book is finished. I’ve written everything I wanted to share for this book, but it is too long. At almost 100,000 words, I’ve been editing away, gotten it down to around 94,000 words, but need to get it down to around 50,000. A daunting task since I’m trying to cover 60 years of life and share the reason for my hope and victory in life. I write because I HAVE to write. The words are in me pushing to get out, and I’ve kept them buried for too long. I know that Rich too dreamed of writing. We talked a lot about writing, and I still have the books we bought to help us get on track.Yes, these past few weeks have been tough, but they do not define who I am or my status before God. Sadness, depression, and loss may impact my days but they do not define my life. Rather, they are the seasoning that enables me to cling to my hope. I don’t know about you, but for me, the only thing that I really truly look forward to is seeing Jesus face to face, being changed into His image, and a new heaven and a new earth where there is no evil, no sin. It is hard to picture that kind of world because we don’t have it and we never will have it. But it’s coming. Jesus has kept all of His promises. Shavuot reminds me of that. Jesus promised a comforter, the Holy Spirit who would never leave us. On Shavuot, God poured out His spirit on the Apostles in the upper room and the world has never been the same. Today, BCE and CE have replaced BC and AD. Perhaps rightfully so—because while this may be the Year of MY Lord—as far as the world is concerned, it is no longer the “Year of OUR Lord.” The world does not want Jesus. The world will accept “God,” on its own terms, but bring in Jesus? Thank you for sharing this, Deb. The Christian Bible story aout Pentecost is a fascinating one. I sometimes try to imagine what it was like to be in that room when those tongues of fire decended. Oh, my.